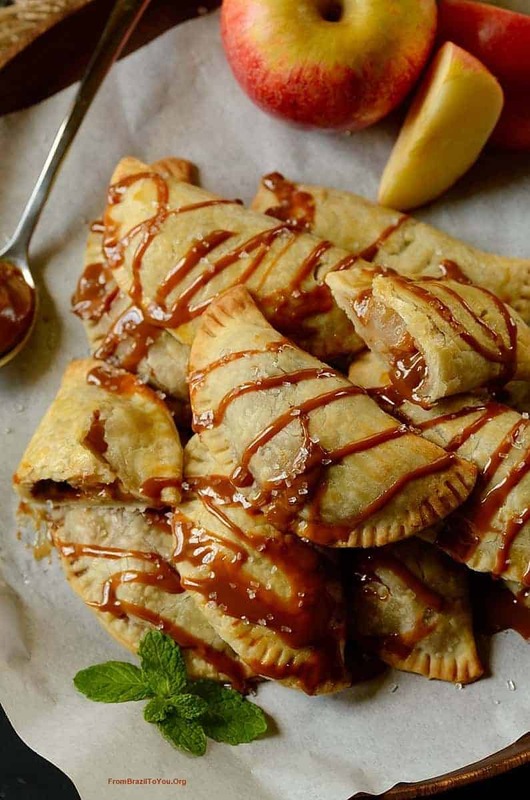 4-Ingredient Dulce de Leche Apple Hand Pies (a.k.a. 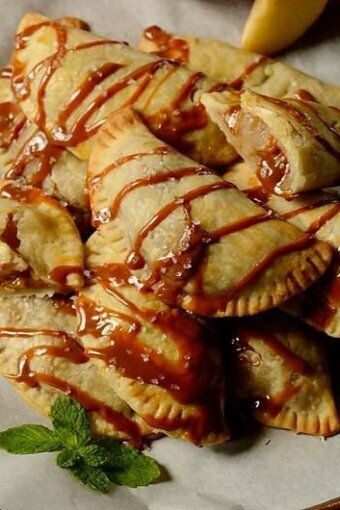 Appoffee hand pies) made in 30 minutes or so and served by themselves, with a drizzle of dulce de leche, or with a scoop of ice cream. Unbelievable! September is almost here… that means that fall, my favorite season, will officially start soon. 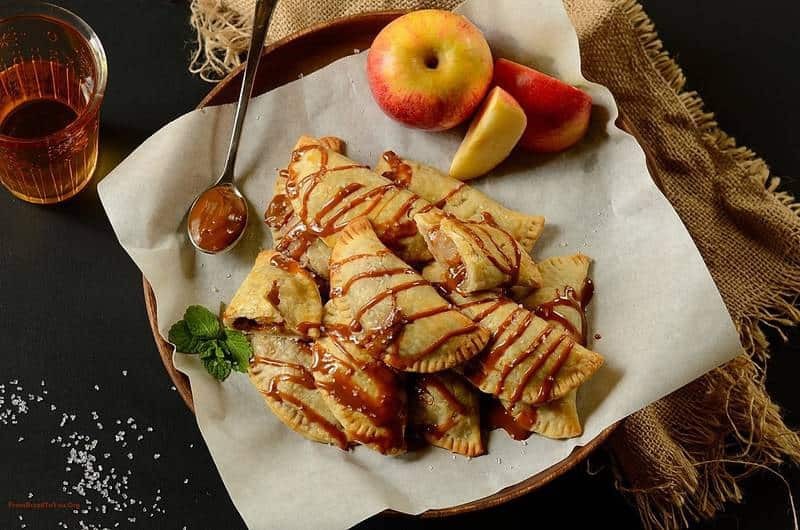 I thought it would be the perfect occasion to prepare these quick and easy, 4-ingredient dulce de leche apple hand pies. These are a fuss-free take on the Brazilian Pastel de Maçã com Doce de Leite, as well as an adaptation of the English Banoffee Pie although these are made with apples instead of bananas. They are small (portion controlled) yet quite indulgent! … and bake for about 11-13 minutes. Voila! Here comes the best part: devouring them… either with a drizzle of dulce de leche or caramel, or with a scoop of ice cream. Yummm! These make a great afternoon snack or quick dessert. Back to school? Having a potluck or get-together? Need to prepare a fuss-free treat that can be transported without a mess? 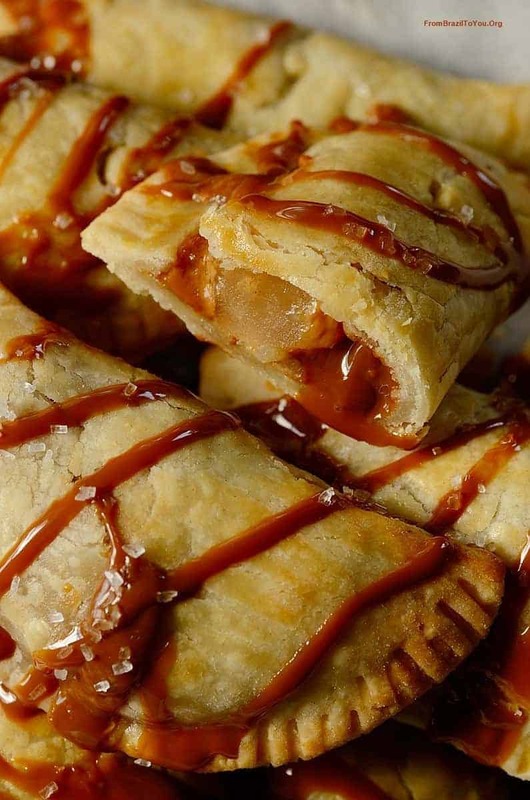 These dulce de leche apple hand pies fit the bill for these or any other occasions! 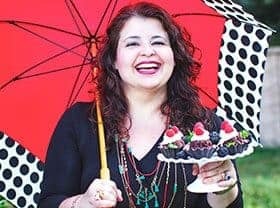 Enjoy the upcoming baking season and all the goodies that it has to offer! 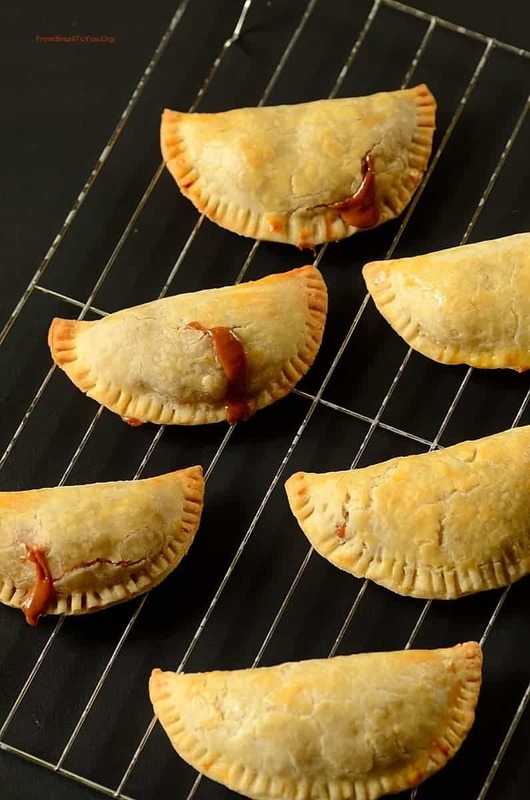 4-Ingredient Dulce de Leche Apple Hand Pies made in 30 minutes or so and served by themselves, with a drizzle of dulce de leche or with a scoop of ice cream. Preheat the oven to 375 degrees F. Line a large baking sheet with parchment paper and set aside. Unroll both pie crusts on a floured surface according to the directions on the package. Using a 4-inch round cookie cutter, cut crusts into rounds. Use all the trimmings to make a ball of dough, roll out on a floured surface, and cut into more rounds. You will end up with a total of 11 circle or rounds. Reserve. Fill a half side of each round with 1 tablespoon of dulce de leche and top it with 3 to 4 small pieces of apple pie filling. Make sure that there is at least a 1/4 to 1/3-inch border from the edges. Brush the edges of the crust with the egg wash, then fold the empty side of the crust over the top of the filling. Pinch your fingers along the edges to seal and then use a fork to make crimp marks all the way around. 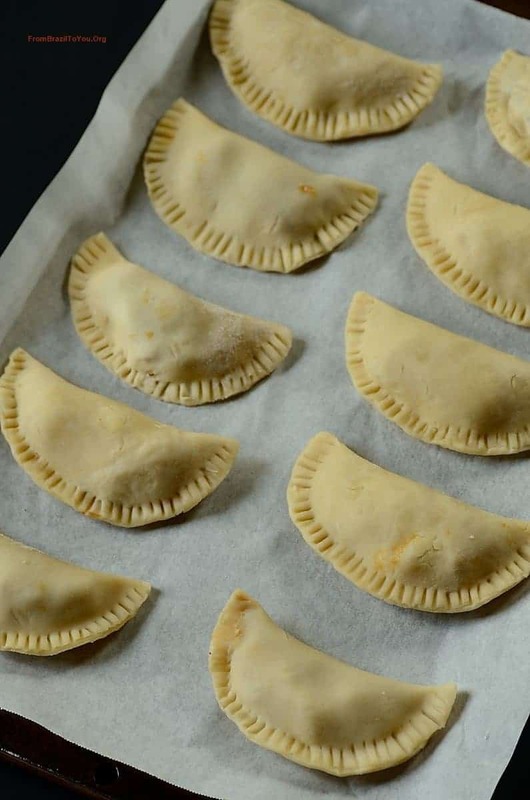 Transfer the dulce de leche apple hand pies to the lined baking sheet and brush the top of the pies with more egg wash.
Bake for 11-13 minutes or until the crust is lightly golden brown. Let cool for 10 minutes on the baking pan, then remove them with a large spatula. Serve by themselves, with a drizzle of dulce de leche/caramel, or with a scoop of ice cream. Enjoy! oh wow! What a fitting welcome to fall! i don’t think I could eat just one of these beauties! Hand pies always look so cute! And it’s fun to say you ate an entire pie. 🙂 These look wonderful — love the filling. Thanks! Wonderful and easy recipe, I like it very much, and I’m sure my kids will love it. Thank you, Raymund!!! They disappeared quite fast.